It hasn’t been easy being away from home over Christmas, but the three of us have managed to make it a special time of year in our own way. It started in Phnom Penh. Warren, Sara, and I made plans to do a gift exchange, and we set out to find each other gifts at the night market. The plan was to go there and do some Christmas shopping, and maybe get some food, too. I had a few restaurants written down as a backup. No need. The night market had it all: bubble tea, fresh spring rolls, duck eggs… you name it. We ended up eating dinner for $2 USD each, with dessert for another $1.25. We sat on a picnic blanket, surrounded by vendors hawking goods and bargain-savvy locals, soaking it all in — the deep-fried food, the intoxicating mix of scents and sounds, and the night air. The whole place is a sight to behold. Picture eight rows of stalls selling everything under the sun: clothes, jewelry, artwork, all up for bartering. Everywhere you turn, there’s something new — it’s sublime. By the night’s end, we grabbed a tuk-tuk ride back to our hostel and watched the city pass us by — a nice alternative to the usual Christmas shopping experience. For Christmas Eve dinner, we went to a hole-in-the-wall just around the corner from where we were staying for some cheap, delicious Khmer food. I ended up with eight-and-a-half spring rolls, and that was just the appetizer. (Some things get lost in translation, including restaurant orders.) The following night, we marked Christmas Day with 50 cent beers in the heart of Siem Reap, capping a day of $6 massages and even more bargain-hunting. It’s been an unconventional Christmas, to be certain: no snow, no carols, no family get-togethers. No movies, no hot chocolate, no evenings spent by the fireplace. Add in the company of friends, and the warmth of the Cambodian people, and it’s been a Christmas to remember, all the same. 1. I can’t explain it, but my beloved (and much-cursed) Miami Dolphins managed to make the playoffs. In true Dolphins fashion, they chose the one season in which I’ve been unable to watch any games. 2. I struck up a conversation with a man from California on the bus ride from Phnom Penh to Siem Reap, and he asked me whether Canadians celebrate Christmas, or just “Boxer Day.” My apologies to my American friends. 3. Tuk-tuk rides are an experience unto themselves. Picture the open-air freedom of a carriage ride, but zippier and a thousand times more chaotic. As in Bali, traffic rules don’t seem to apply. Miraculously, I’ve yet to see a single crash. 4. My bartering skills need work. Warren has mastered the art of walking away, and Sara has been on a run of good deals herself, but I find it hard to say no — even when I wasn’t going to buy anything in the first place. 5. We went to see the Choeung Euk killing fields in Phnom Penh. It’s a serene field and orchard today, but remnants of the horrors committed there under Pol Pot’s regime remain. The atrocities committed are unfathomable: millions died at the hands of the Khmer Rouge. The pits in the ground are still there. My initial thought was gratitude that I live in a country where I don’t have to live in fear of this sort of thing. Then I remembered the stories of residential school survivors: theirs is a lost generation, too. In the midst of this sadness, I was struck by a sign of hope as I finished the tour. For the first time that afternoon, I checked my watch: 3:16. I’m hardly in the habit of quoting Bible verses — I only know a handful to begin with — but it hit me all the same: in the midst of carnage, of horror, of grief and sorrow, a seed of hope. Angkor Wat is a 12th-century marvel. As impressive as it is from a distance, it’s even more striking up close: the attention to detail in the walls’ carvings is almost beyond belief. I struggle to wrap my head around how long it would have taken to complete. Although less famous than Angkor Wat, Bayon deserves its own share of attention. Over 200 faces are carved into the temple’s walls, all smiling down on visitors. Here’s a glimpse at life in the back of a tuk-tuk. Not all cities are as hectic as Phnom Penh — indeed, some are even more frantic — but life in the capital moves fast. Hold on tight. Contrary to appearances, this wasn’t the getaway plan for a bank heist, but rather a normal Friday morning. I was looking into renting a scooter. “Hide your notes,” the rental agent continued. To say Kuta’s roads are hectic is an understatement. Lanes lose meaning. Cars and motorbikes fill the road, and then the sidewalks, too. Learning to cross the street as a pedestrian is a bit like entering The Matrix: time slows, until you begin to see openings you thought didn’t exist. Ever see George Costanza in the Frogger episode? That was Warren and me on our first day — forward, back, left, right, all just to get to the other side. It’s no wonder many people give up and hail a cab. My “welcome to Bali” moment: stepping out of the airport and immediately being confronted by two dozen prospective cab drivers, all swearing they’ll offer the best price. There’s one taxi company in Bali that operates on metres — the entire fleet of cars is a bright metallic blue. Hard to miss, right? The trouble is, every other taxi has mimicked the same exterior and logo, minus a few details. Learning to tell the real from fake is an initiation rite, of sorts. By day, they’re easy to spot; by night, it’s a different story. We learned the hard way on our first night and paid nearly triple for a ride to our hostel. 2. 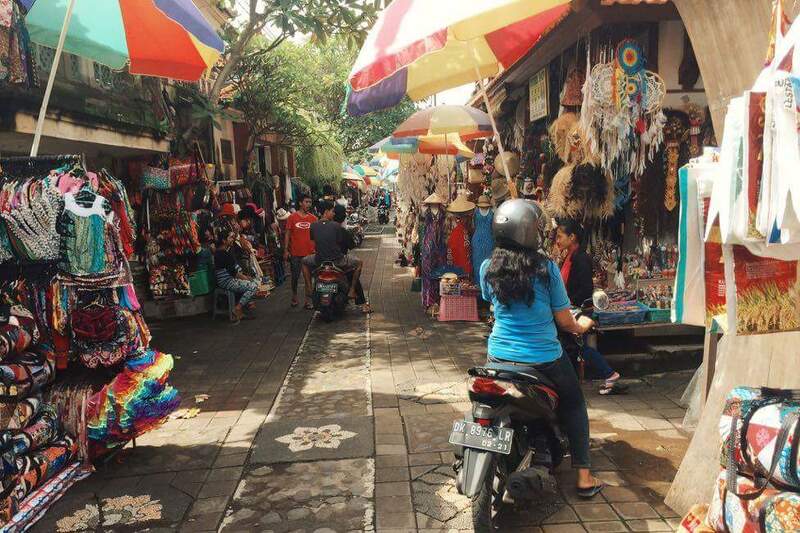 A word on Sara: she joined us in Kuta, and I swear she has something packed in her bag for every possible scenario. She also takes better photos than I do, so you can expect to see some every now and then on the blog. 3. What do you do with a nine-hour layover at an airport? If you’re Warren and me, you go for one last (but probably not really the last) hurrah at a certain fast food chain. Thankfully, kids are an endless source of entertainment — we watched one kid throw his three-quarters-full pop bottle at the ground, presumably because he could and wanted to, and then saw him pick it up and start drinking from it again as if nothing had happened. Kids, man. 4. I’ve had a crappy cup of coffee before, but never quite like this. Warren, Sara, and I tried kopi luwak — the “world’s most expensive coffee,” famed for its process of coming from beans passed through the digestive system of the Asian palm civet. A small cup will set you back 120,000 IDR, or about $12 CAD. The verdict? Pretty much like regular coffee. 5. After two and a half months spent pinching pennies in Australia and New Zealand, food is refreshingly cheap. A dinner portion of nasi goreng (chicken fried rice) often comes out to no more than $2.50 CAD. I haven’t cooked yet. 6. I also now know what it’s like to hold a million Indonesian rupees in my hands. Check that one off the list. 1. Ubud’s Sacred Monkey Forest. Monkeys are all over the place in Bali. They fill the trees; they fill the temple grounds; they fill parking lots. They’re a bit like squirrels in Southern Ontario, only craftier: they seem to take a liking to any personal belongings they can grab, which is a problem when they can run, jump, climb, and go just about anywhere you can go. I witnessed one poor girl stand helplessly with a monkey on her back, rummaging through her knapsack — which, it struck me, really helped to nail home the whole “monkey off your back” metaphor, but probably wasn’t of much help to her in the moment. I started this trip in love with monkeys. Then, I began to fear them. Now, I think I’m back to loving them — albeit at a distance. The babies in the monkey forest are just too cute to hold a grudge against. A true sight to behold. A guide took us through the rice terraces just outside of Ubud, explaining the growing seasons for different varieties of Indonesian rice and their cooking purposes. Mostly, you notice the sheer abundance of green everywhere — it’s amazing. We’ve seen some stunning sunsets in the past few months, but I’d put this one up against just about any of them. Seminyak faces west on Bali’s southern peninsula, looking out onto the Bali Sea and beyond. With another hot and humid day in the forecast, we gladly spent the afternoon and early evening at the pool, sipping Bintang and savouring the temporary escape from the heat. The view was a nice bonus. Any reader — serious or casual — holds one book more closely than all others they’ve read. Mine is The Hobbit. I fell in love with Bilbo’s Middle Earth as a 10-year-old and wrapped myself in the universe like a warm blanket. It was a place of adventure, of bravery, of magic. It still is. Say what you will about the movies, but they took me back to that place again — and they also gave me a place in the real world where I could find myself transported to another. So it was that when Warren and I arrived in New Zealand, we kept our eyes peeled for filming locations. In some ways, you don’t have to look far at all: the whole country looks like it came out of Middle Earth. The mountains, the forests, the lush, green hills, it’s all there. 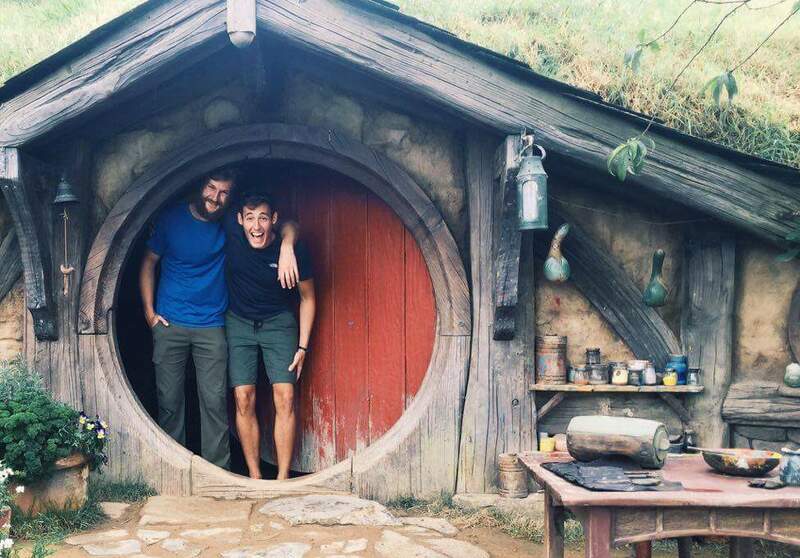 These are just a few of the LOTR-themed things we’ve seen in New Zealand. What a treat. We spent the better part of a morning wandering through the Shire, strolling past Bilbo’s house and countless other Hobbit holes. The set was actually torn down after the Lord Of The Rings films and was painstakingly recreated for The Hobbit films years later — right down to making the now-permanent set appear to have been made from the same temporary supplies that were used the first time around. You can climb the real Mount Doom if you want to — it’s an active volcano called Mount Ngauruhoe, found in Tongariro National Park. It takes an iron will, though — the trail for the climb starts after you’ve already been walking for three hours, with another three hours to go after returning from the climb. The aforementioned scene from The Fellowship Of The Ring. We tried forever to find the tree trunk where Frodo and friends hide from the ring wraiths after jumping off the path, but it was a fool’s errand in a forest full of them — not to mention that the scene was shot over 15 years ago. In Search of Hobbits, Part 1: Hobbiton Woods. We accumulate layers over the years, telling ourselves we are who we are because of our careers, our accomplishments, or our social standing. We present ourselves to the world through carefully-crafted profile photos and condense our lives into 140 characters. All of this may hint at who we are, but it never quite hits the mark — instead, it often falls far short. It’s remarkable, then, how a conversation with an old friend can peel all those layers back to a place you forgot existed. Warren and I go way back — Kindergarten, to be precise. 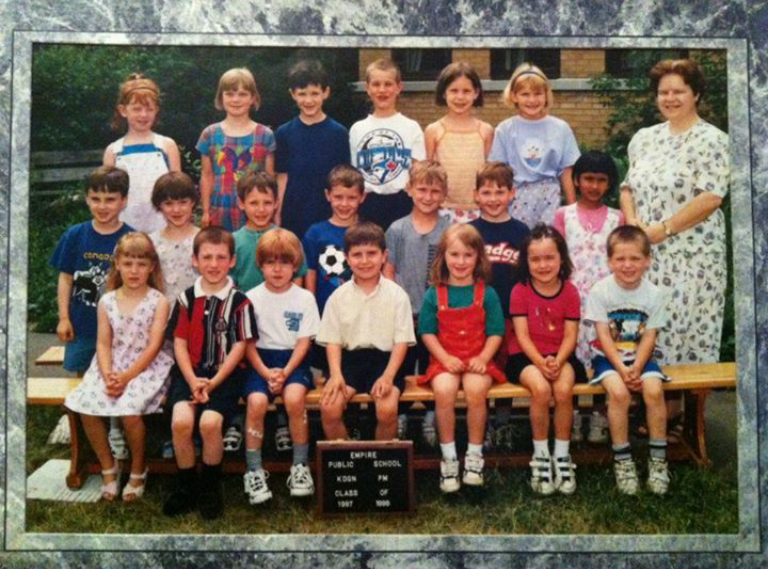 That’s him in the middle row with the green t-shirt. (I’m harder to pin down these days, what with the beard and all, but I’m two over to his right in the grey.) What I’ve learned over the past three months is just how much of my past is his past, and vice versa. We talk about it often on the road: elementary school crushes, sleepovers and birthday parties, teenage shenanigans. We’ve reminisced on everything from the best Saturday morning cartoons to our high school hiccups. With each conversation, another layer gets peeled back. It’s easy to forget we weren’t always the people we’ve become. We accumulate scars, create expectations, and find moulds to fit into, all in the name of finding our way in “the real world.” A friend of mine told me recently how all of her friends were getting married and she felt pressured, as though she was deemed lesser for being at a different stage in her life. I know how that feels — I suspect we all do. All of this — the practice of keeping up with the Joneses, so to speak — distracts us from who we really are, and ultimately, what really matters. Conformity and comparison are killers. I cherish these conversations, these chances to look back and remember where I came from. I remember my hopes and fears from those years, how they’ve changed over time, and how they’ve stayed the same. I see it in Warren, too, and with each friend I look at in that picture. I think of how lucky I am to have the same friends after all this time. More to the point, I realize just how far I’ve come since then — from playground slides, to Canadian highways, to the top of New Zealand. With any luck, I’ll continue further still. 1. All we wanted was a place to sleep. Warren and I made the late evening two-hour drive to Te Kuiti and pulled into our campground, eager to plunk down for the night. The place was busy, but eventually, we found a spot with a picnic table right by the river. This could be good! I thought. I let out a sigh of relief after the long day’s journey. It was at that moment that Warren noticed our campsite neighbours: one of New Zealand’s most notorious gangs, complete with leather jackets and face tattoos. As quickly as we pulled into the campsite, we pulled back out and found the farthest corner possible for the night. 3. On a related note, my alternate title for this week’s blog post was Tuesdays With Maori. 4. This past week has been a reminder that home isn’t a place, but a feeling. We spent two wonderful days in Wellington visiting an American friend we made in Byron Bay, and another two lovely days in Wanganui with good family friends. We also made friends with our gracious hosts in Ngarauwahia. It’s a feeling I’m especially grateful for as the Christmas season approaches and we continue our travels. Nature provides the best entertainment. We went with our Wellington friend, Hannah, to Red Rocks for a coastal hike — a place steeped in Maori lore, and a favourite spot for New Zealand fur seals, too. We had been sitting and chatting for a while near the rocks when all of a sudden, a seal’s head popped up just 15 feet away from us. It had been sunning itself there the whole time without us knowing — an impressive feat for an animal that can weigh up to 330 lbs. The only way I’m willing to walk 20 kilometres in one go. We started at 9am and didn’t finish until nearly 2:30pm. Along the way, we met a couple Canadians from Calgary and had a good chat about each other’s travels. For Lord of the Rings buffs, the Tongariro Alpine Crossing takes you right past Mount Doom. It was awe-inspiring to see the peak so close, surrounded by cloud. The reward for the walk is great: once you’ve reached the summit, you descend to breathtaking views of Lake Taupo and beyond. There’s something about walking through a dense forest that’s good for the soul. Warren and I strolled through the redwoods in Rotorua for the better part of a morning, craning our necks at sights like these — it’s hard not to be in awe of the immensity of them.